Along the lines of the appetizers I talked about yesterday, I wanted my main course to be made up of things I could prepare in advance, then just set out on a quick cruise through the kitchen later in the evening. Since it was a summer party, naturally cold dishes like salads work well here. 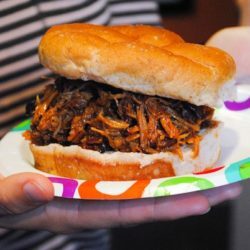 I also relied on my slow cooker to serve hot chicken lettuce wraps, and my husband and his outdoor grill for grilled pizzas. Cranberry-Walnut Salad w/ Feta & Apples – the little salad that could, that took me just five minutes. 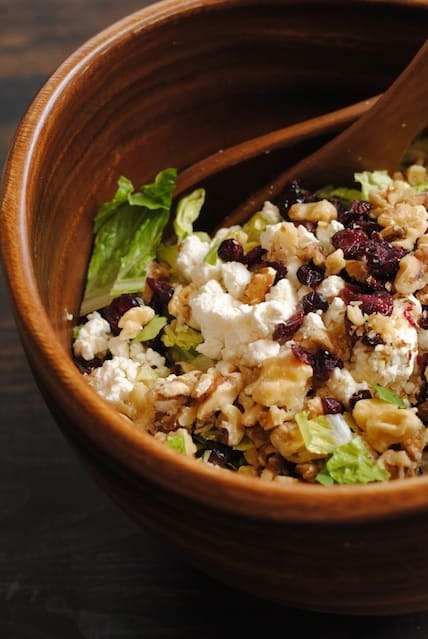 All I had to do was chop the lettuce, then dump in copious amounts of the good stuff – walnuts, crumbled feta and dried cranberries. I did all of this the morning of the party and kept the salad in the fridge. I also had a friend chop up some Gala apples and throw them in right before we put this out, while I was getting the rest of the dinner stuff out of the fridge. Served with a raspberry-poppyseed vinaigrette, this is a never-fail salad combination that just about everybody seems to love. 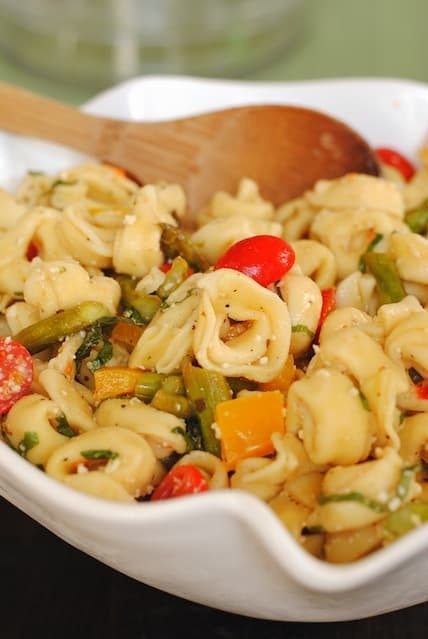 Tortellini Pasta Salad – adapted from Lane at Supper For A Steal, after I read her post noting that this is a great filling option for vegetarians. I don’t think I had any vegetarians at the soiree this year, but you just never know who might have a (vegetarian) friend in town tagging along. That happened last year, and I was happy to have her, and luckily (whew!) had plenty of vegetarian options for her. I wanted to continue that trend this year. I used frozen cheese tortellini for this (You didn’t really think I made homemade tortellini, did you? Are you crazy?). I gave the tortellini a quick cook, then tossed it with a herb vinaigrette and a little Parmesan, and stirred in chopped yellow peppers, grape tomatoes, and some roasted asparagus I had left over from earlier in the week. I made this the day before and kept it refrigerated until the party. Easy, peasy, DONE. Millionaire’s Fruit Salad – While I may have been a deadbeat photographer busy drinking sangria who forgot to take a photo, my friend Lisa offered to bring a fruit salad, and I gladly took her up on the offer. All of the fruit at the party can’t be soaked in wine, right? Well, I mean, it could. But Lisa made us a great salad that corresponded with my very demanding specifications for what a proper fruit salad should be (Yes = strawberries, pineapple, watermelon, blueberries. No = out of season cantaloupe, kiwi, kiwi, kiwi). Yes, if you want to make me a fruit salad, get nervous. I have demands,people. 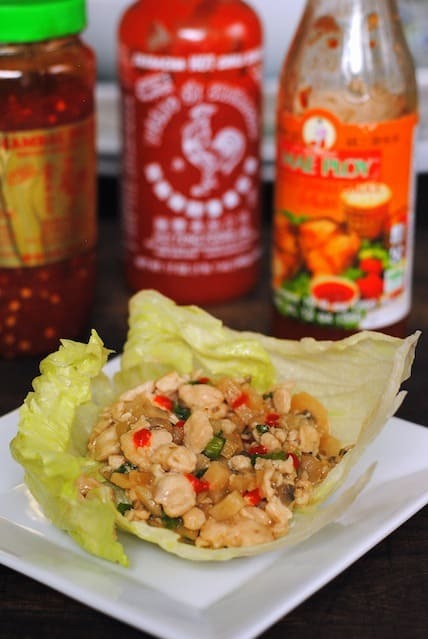 Chicken Lettuce Wraps – recipe from the Food Network. So, these were supposed to taste like P.F. Changs lettuce wraps. Did they? Not quite. But did they still taste delicious? Yep. I cooked the chicken mixture the day before the party and made sure to chill it down as quickly as possible (quick = safe). Then, I re-heated it the evening of the party on low heat in my slow cooker for two hours, making sure to bring it up to 165ºF before serving. Sorry to get all ServSafe on you, but once you learn food safety rules, it’s impossible to un-learn them. Safety first, peeps. I served the chicken mixture with iceberg lettuce cups, crispy lo mein noodles for topping (not pictured), and a variety of Asian condiments (Sriracha, Sambal Oelek, and Mae Ploy sweet chili sauce). Grilled Pizzas – while I was setting out these dishes inside, Jeff was outside firing up the grill. 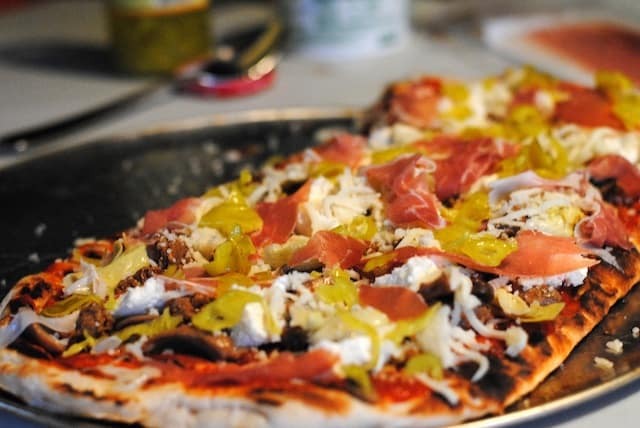 He had pre-cooked all of the pizza toppings which meant that all he had to do was stretch out the pizza dough and give it a quick grill, then top it with San Marzano pizza sauce (none better) and mozzarella cheese. He then had our guests band together in small groups, pick their toppings, and create their own pizzas. Toppings included spicy Italian sausage, pepperoni, prosciutto, grilled chicken, crispy bacon, ricotta cheese, red and green peppers, sauteed fresh mushrooms, artichokes and banana peppers. Read Jeff’s full Grilled Pizza Tutorial here. Stop back tomorrow for the final installment of Sangria Party Week – dessert! And here’s a secret – I didn’t make a single one of these desserts. And it was glorious. Sangria Party Week?? That just sounds like an automatic good time. That cranberry walnut salad looks particularly amazing and low-fuss. Thanks Irina! I think you’re right – whenever you have sangria, you’ll have a good time! It’s impossible not to! What an amazing menu! I want to come to one of your parties!!! I need to take lessons from you on how to do a seamless party. I love the menu, everything sounds wonderful and you were actually able to enjoy yourself at the party because you chose foods that can be prepared in advance. 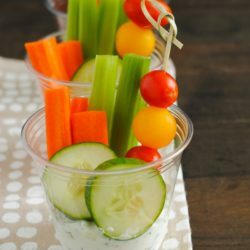 Very smart and delicious, love that salad too! It’s definitely taken me a few parties over the years to get the hang of it, but it’s do-able. The key is definitely serving lots of cold food (or using your slow cooker), and putting everything on it’s serving platter beforehand. Throw it in the fridge. Put the serving utensils in the fridge with the stuff, too. Right on top. Also, do you have a dishwasher? If so, shove EVERYTHING there as it’s finished being used during the party. Don’t even sort. Don’t even rinse. Just shove everything in there. You can always sort, rinse, and run the dishwasher (in batches, if needed) the following day when you’re alone. Just use it as a hiding place! If you don’t have a dishwasher, the oven works for this, too. Hiding stuff sounds crazy, but it’s seriously key to enjoying yourself doing your party and not being stuck cleaning up. I have had more than a few parties and always end up working while everyone else is enjoying themselves. Your suggestions are really good. Yes I have a dishwasher so I can definitely shove it all in. Good idea too!! Oh my gosh, roasted asparagus in tortellini pasta salad sounds great! Everything else on the menu sounds wonderful too. I’m hosting a small dinner party soon can’t wait to use a few of these recipes. Thanks, Lane! Honestly, I wasn’t planning on the asparagus, but I had roasted a big bunch of it earlier in the week, and it just had’t been eaten come party time. In an effort to totally clean out the fridge before the party…into the pasta it went! hahaha.